Our Thanksgiving Chook. No turkey for us; we’re having turkey for WinterPaganFestival, and I don’t eat turkey more than once a year. Dry rub of brown sugar, salt, pepper, paprika, cayenne pepper, random couscousesque spices slathered all over washed and dried chicken. 12oz can of beer opened, and taste tested. Important, that… More spices added to remaining beer in can (~10 fl oz). Chicken delicately placed onto beer can (as photo shows). Grill prepared. Ashy charcoal pushed to sides of pit, medium sized foil baking tray placed in middle. Cup of water poured into tray. 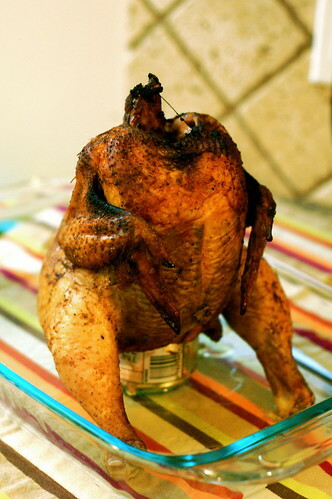 Chicken with beer can up its bum placed on tray. Chicken and can taken out of pit (taking care not to spill hot beer) and allowed to rest for 10-15 min. This entry was posted in akatsuki eats and tagged bbq, chicken on a beer can, recipe. Bookmark the permalink.